features the photographic prints of stone balances created by Pennsylvania artist Tim Anderson. The balances are created in personally selected natural locations and consist of stones found in the direct vicinity in which they are balanced and photographed. No stones are brought in or used from other areas. Nor are any adhesives, rods or trick photography used. They are all simply balanced and sitting atop one another seemingly defying the laws of physics. Since the precarious balances normally last only short periods of time in nature, photographing them is the way to add permanence to these short-lived creations. Once standing they are photographed (another artistic passion of Tim’s) in the natural beauty surrounding them. Framed photographic prints are found throughout the building with the majority on the first floor and staircase. The studio space on the second floor of the building is where the printing, matting and framing takes place as well as consultations for those wishing to custom order prints or sets of images. With other offerings such as greeting cards, calenders, and matted prints there is something for everyone interested in owning images of these unique and gravity defying creations. 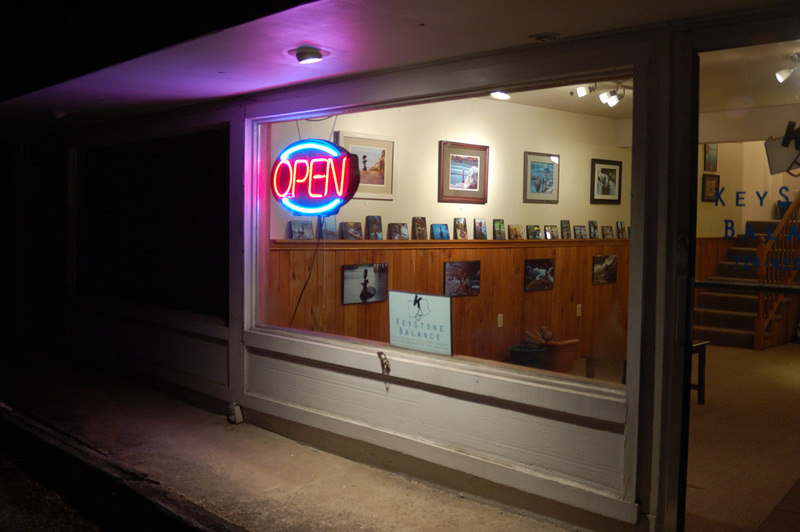 The studio/gallery is conveniently located approximately 2 miles east of the Donegal exit off the Pennsylvania Turnpike on route 31. Open by appointment. Call 724-415-8288 to schedule a visit. Tim, seeing your spirit in stone takes me back to our experience in the vertical world of rock. Will never forget our winter morning at Cucumber, epic day.Would like to acquire 2 photos to add balance to our bedroom. How and where? Still at the same house on Back Creek. Wags 412-551-1859. I would like to purchase photo …can u provide info on how..